The first of many sequels to the surprise hit of 1976, Rocky II continues the story of slow but likeable boxer Rocky Balboa. The film is a polished character study with a rousing climactic fight, but the raw tenderness of the original is naturally missing. The film starts exactly where the original ended, with unheralded boxer Rocky (Sylvester Stallone) losing a split decision to heavyweight world champion Apollo Creed (Carl Weathers), but winning the public's heart and the love of girlfriend Adrian (Talia Shire). Post-fight Rocky retires, marries Adrian, and quick spends the little money that he earned. He does his best to find respectable employment, but not much works out for him, and he ends up back at the meat processing plant and then running trivial errands at the gym owned by his trainer Mickey (Burgess Meredith). Apollo is embarrassed because the fight was much closer than it should have been, and starts a campaign to humiliate Rocky into accepting a rematch, vowing that this time he will win in short order. With his money and options running out Rocky reluctantly agrees to a second fight and starts training with Mickey, against the wishes of Adrian, who is now very pregnant. But without Adrian's support Rocky puts no real effort into training. When a health scare strikes the family, his attention is diverted further away from preparing for the fight, leaving him vulnerable to a potentially crushing defeat. This time Sylvester Stallone writes, directs and stars, and all the gang from the original film is back, including Burt Young as Adrian's brother Paulie and Joe Spinell as Tony Gazzo, the friendly neighbourhood loan shark. The sequel is well-made, invests the time to build to its single fight, and allows the central character to grow and develop further as a person. But Rocky II suffers somewhat from an egotistical undercurrent. Most of the film is about Rocky struggling to adjust to life outside the ring, and Stallone directs himself with a persistent whiff of humble smugness that gets tiresome. The performance is not the problem as much as the cutesiness of the character, as Rocky seems unable to do anything wrong, but the world around him conspires to turn a cold shoulder on the loveable lug and his equally sappy big dog. Moments of humour do help, and nevertheless it is difficult to dislike Rocky given his propensity for self-depreciation. 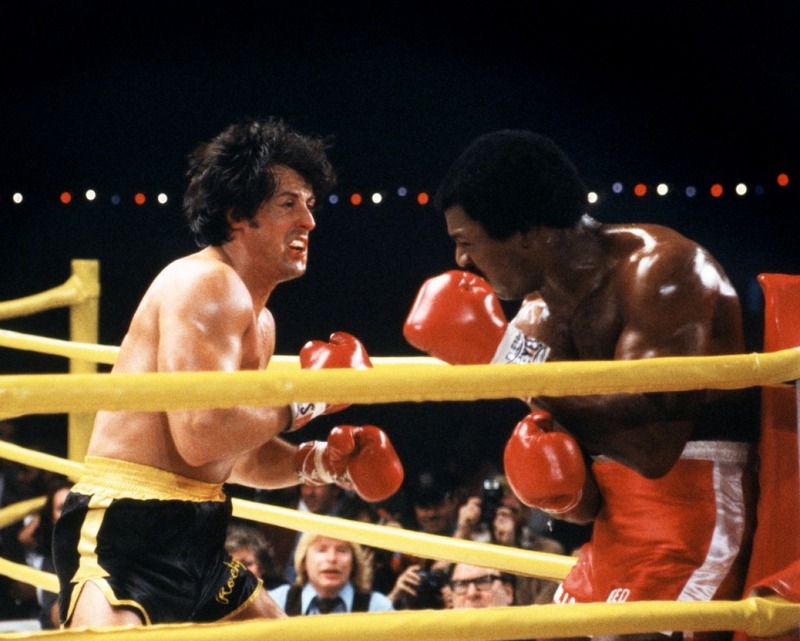 Once Apollo goads Rocky to commit to a rematch, the film switches to his lack of motivation due to Adrian's lack of support and then a long stint dealing with a medical emergency. This is by far the weakest part of the film, and although the attempt is laudable, Stallone is simply not ready to write, direct or star in dramatic scenes where emotions drive the plot. The whole segment comes across as childish, including Mickey screaming incessantly but uselessly at his boxer to shape up, and repetitive scenes of Rocky in a chapel waiting for divine intervention. The climactic showdown kicks the energy level right back up to maximum levels. The rematch in the ring is more of a brawl than a recognizable boxing fight, both fighters throwing punches with wild abandon and ignoring anything that looks like defence or strategy. But it is also undoubtedly exciting, and Stallone finds a rousing ending to conclude the film on a high. 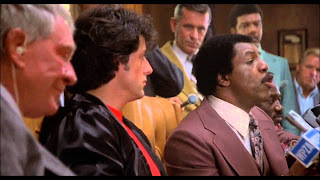 Just as Rocky the fighter deserved a rematch and a second shot at the title, Rocky Balboa the character deserved at least one sequel, and Rocky II is a decent enough effort. It was never going to carry the pathos of the original, but it progresses the story of an unlikely hero into the next phase of his career.